As special education teachers, we often are not provided with appropriate resources to assess our students current levels of learning. Or the resource we are given doesn’t meet the needs of all of the learning styles in our classroom. We always make it work, we’re superheros! But it’s time to use our superhero strengths for something else. 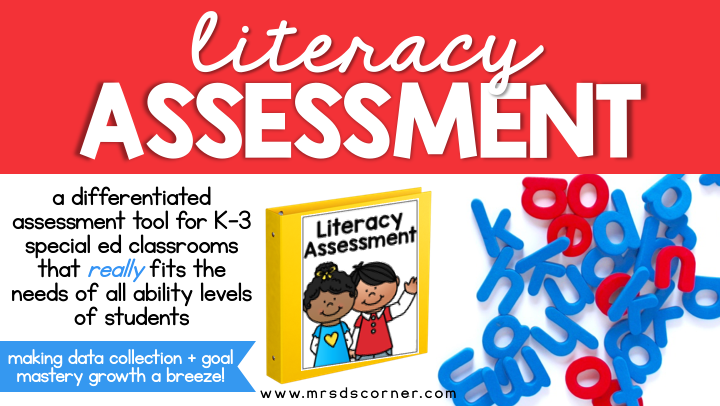 This Literacy Assessment bundle includes all of the parts needed to assess your students on the early elementary skills needed in grades K-3, with all the data sheets needed to collect baseline data and show progress on the mastery of the skills. The assessments are differentiated, making them easily accessible for all levels of learners in a thorough, consistent way. You and your administrators will have confidence in knowing that this literacy assessment fits the needs of all students across exceptionalities and limited communications. 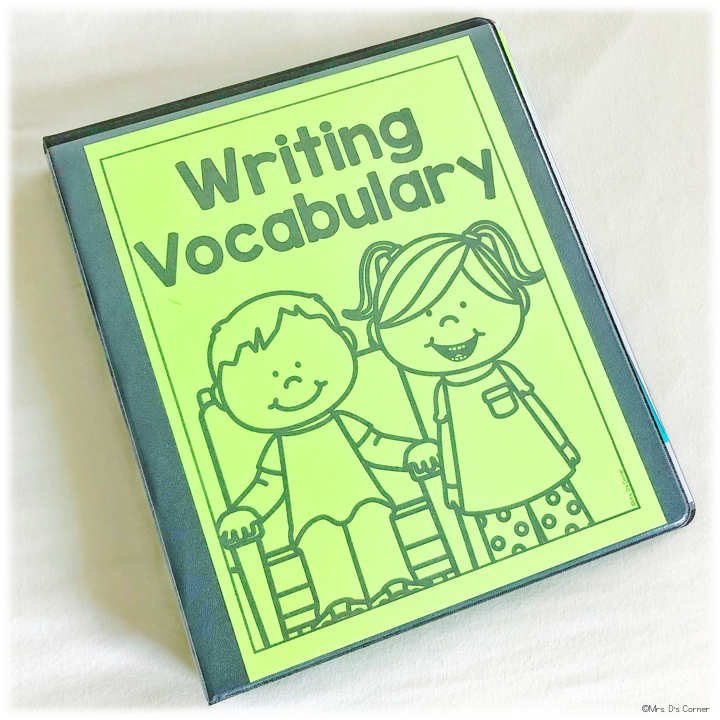 Multiple word lists are included, as well as multiple levels of fluency and comprehension checks… again, differentiated for your readers and non-readers, writers and non-writers, etc. with oral responses, written responses, and/or picture responses. You can assess students at the beginning, middle, and end of the year, or assess incoming students throughout the school year to see where they are academically. Never scramble again when you get a new student or enter a new classroom. Assessments can also be used for or as benchmarks, or with students who do not perform well on the state-assessments… use this assessment to demonstrate student strengths. The binder system is simple to put together, with instructions included and is an assessment resource you’ll have for years. It isn’t something you need to update each year or worry about. 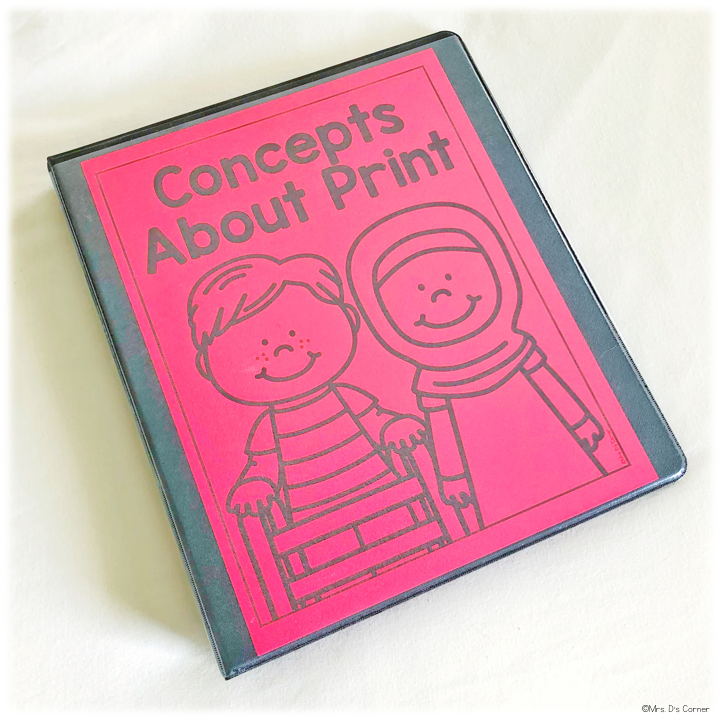 It’s always ready to print or copy and assess your student’s skills. 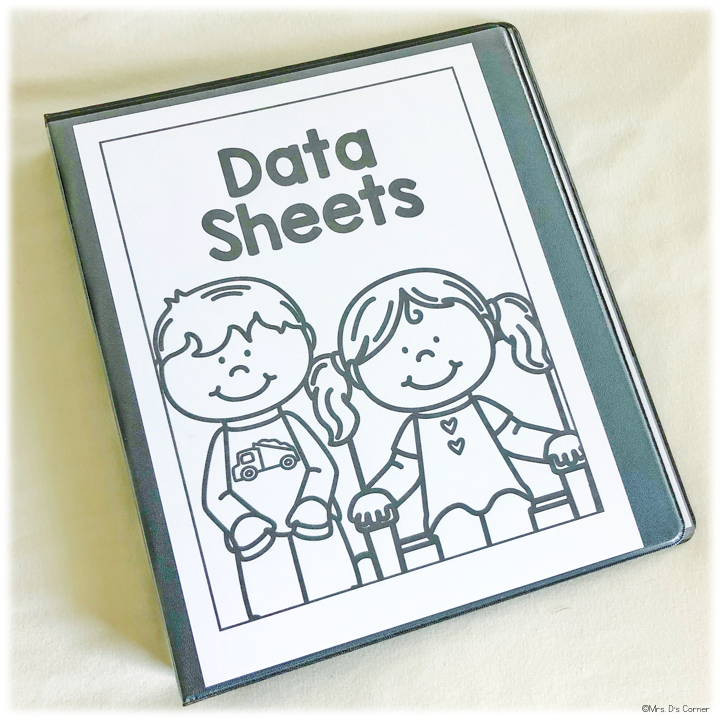 Instructions are included for each individual assessment, making it easy for paraprofessionals and support staff to help gather data on students. And last, but certainly not least, this assessment helps with inputting actual data, giving you the data points and baselines you need to really progress monitor and achieve IEP goal and objective or RTI mastery. So what comes within each section of the Literacy Assessment system? one sheet for easy referencing. Each section of the assessment also includes a skill specific data sheet that you can use for one calendar year to chart progress. 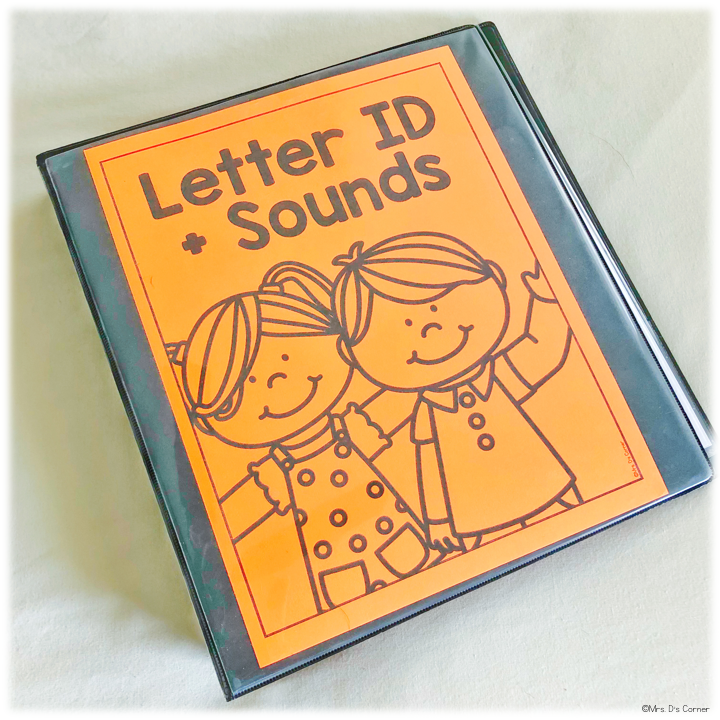 Letter ID + Sounds can be one binder or two; I keep both assessments in one binder. Includes assessment for student identification of letters (26 upper and 28 lowercase), as well as the sound and formation of each letter. Lists and flash cards for each portion included for differentiation. Choose any book or have your student choose the book. Use the data sheet included to guide assessment. Flash cards with each portion of assessment are also included (with real pictures used). Dolch Pre-Primer through Third lists and Fry First 500 words are included. Word lists are separated into preset lists of work, including assessment flash cards and list style assessment. Sentences are based on the preset word lists. 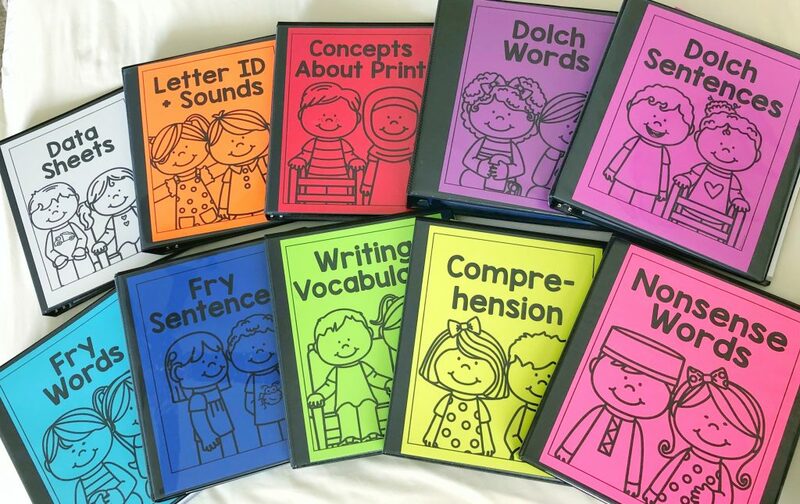 Includes 4 types of writing paper, as well as the cut and paste sentences for our lower level students. Instructions and writing sheet included. Let students write all of the words and letters they know (even if it is “scribbles”!) It all counts. 16 leveled passages included, with a fluency data sheet and a comprehension data sheet. 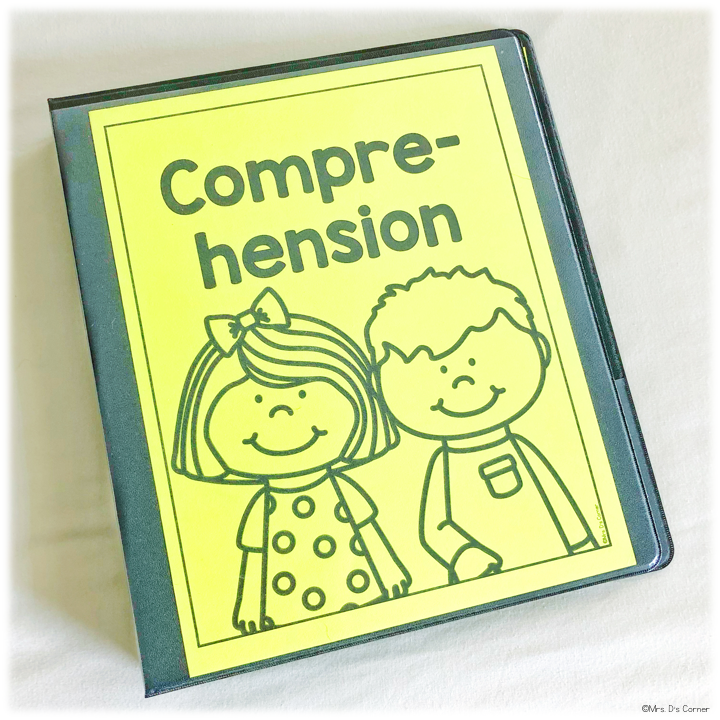 Comprehension questions are differentiated into 4 levels: write the answer, word answers, picture with word answers, and pictures answers. This assessment is formatted identical to the Dolch/Fry word lists. 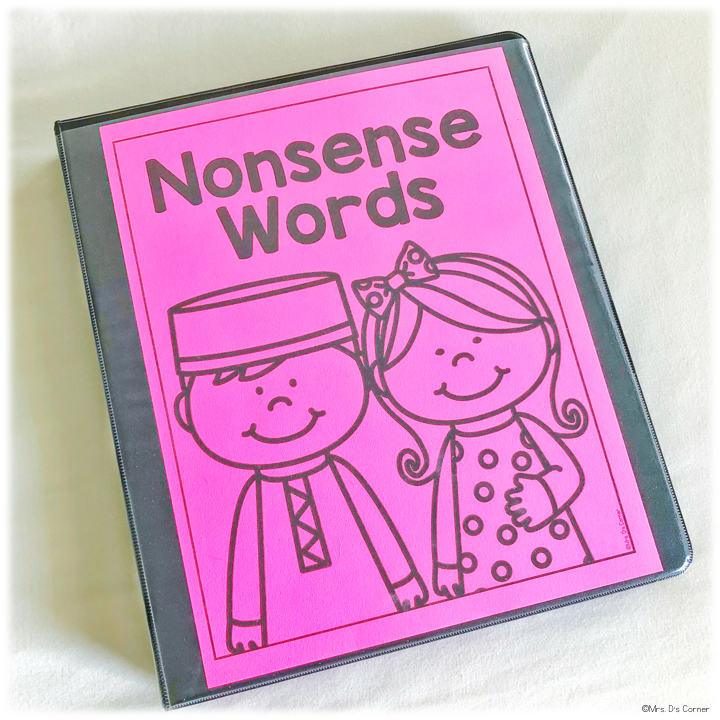 It contains 3 separate sets, with 4 different lists per pack… for a total of 12 different nonsense word lists. Flash cards and lists included for differentiation. As teachers, we need to adapt our assessments to what our students enjoy (to some extent) and provide them with appropriate accommodations and modifications to meet their needs… as well as keep them engaged in learning. Included in this assessment are a few digital portions to better help you differentiate and accommodate your students learning and assessment styles. Simply download this resource on your computer. Then upload the PDF flash cards to your Google Drive or PDF reader app on your tablet or iPad. You can easily use the flash cards on any computer as well! At this time, the flash cards are the only digital portion of the Literacy Assessment. 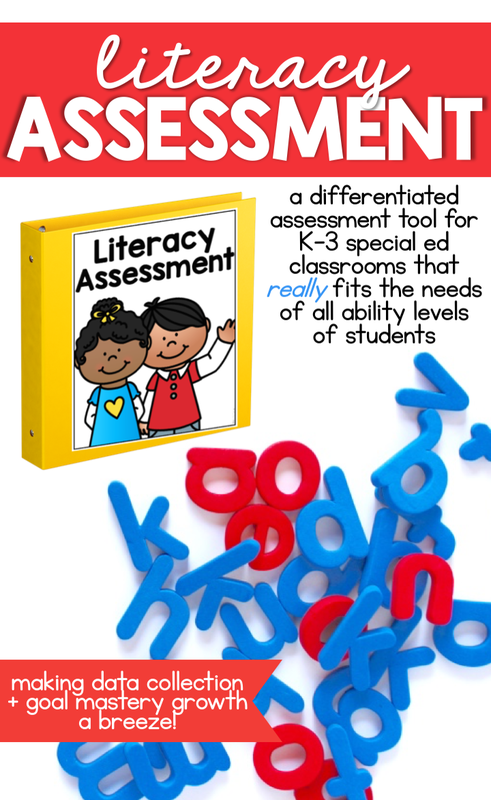 There are so many parts to this Literacy Assessment (it really is all-encompassing), that you are probably now wondering how in the world you are going to store it all and keep it organized in an easy-to-use manner. I store the Literacy Assessment parts inside of black 3-ring binders. Each section of the assessment gets its own binder, but you can use one large binder. Whatever is easiest for you. 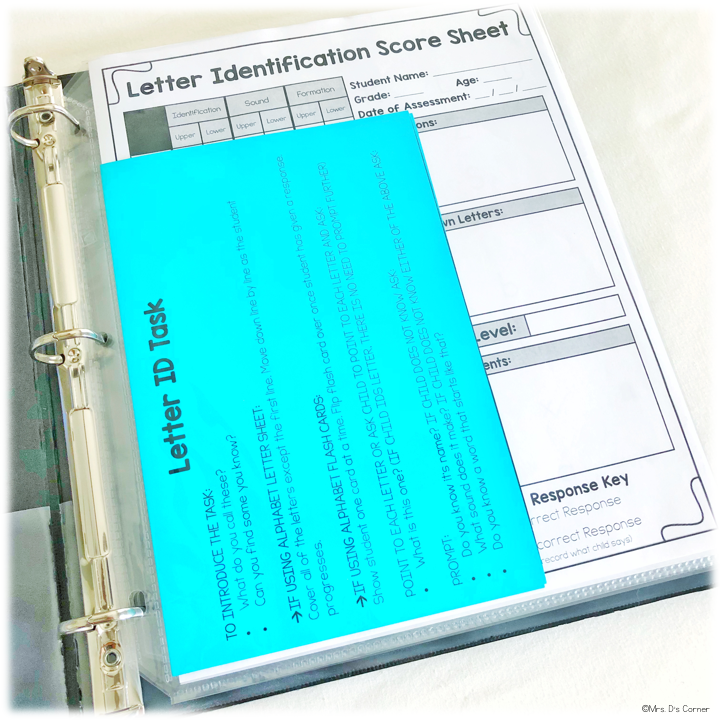 I use page protectors to store the assessment pieces inside of each binder. I, also, print the instructions on a piece of colored cardstock and slip it into the first page protector of each binder. 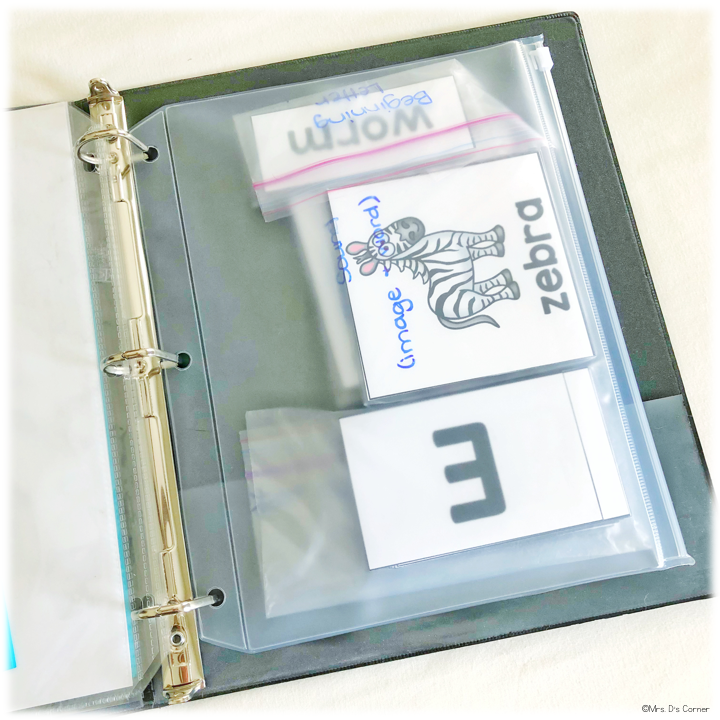 To store the flash cards and non-list items, I use 3-ring binder pockets. I found mine at Office Depot for $3 a piece (a little expensive… but they’ll last forever), but you can use any type of pocket or folder to store them. You can also store these pieces in the Iris photo bins and label the bins. In addition to the Literacy Assessment, there have been a few add-ons the the resource that will really help you cover all of the skills your students are working on and need to master in grades K-3. 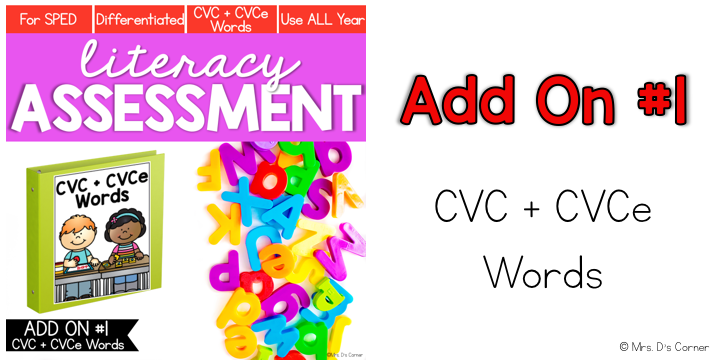 There are 5 CVC word list sets included (a, e, i, o, u), and each set includes 4 lists of words. Total of 20 different CVC word lists. CVC flash cards included for each word list. Assessment instructions also included. There are 2 CVCeword list sets included (bossy e, silent e, and magic e), and each set includes 4 lists of words. Total of 8 different CVCeword lists. CVCeflash cards included for each word list. Assessment instructions also included. There are 3 word list sets included (L blends, R blends, and S blends), and each set includes 4 lists of words. Total of 12 different blends word lists. 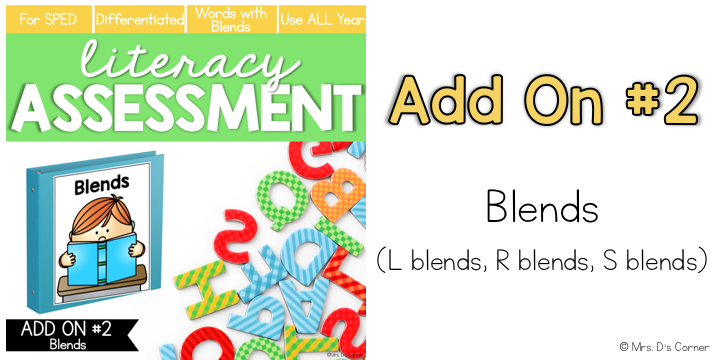 Blends flash cards included for each word list. Assessment instructions also included. There are 6 word list sets included (2 Digraphs, 2 Digraphs Mixed, and 2 Trigraphs), and each set includes 4 lists of words. 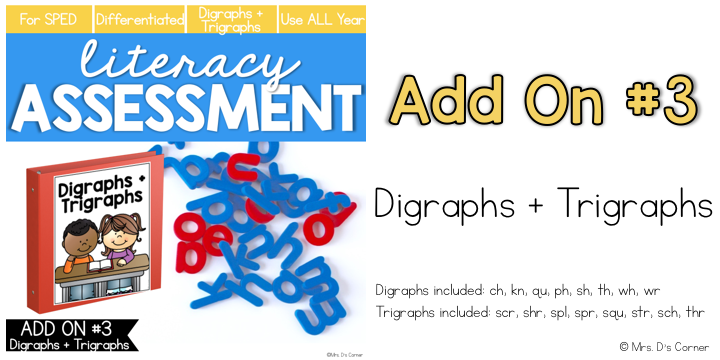 Total of 24 different digraphs/trigraphs word lists. Digraphs and trigraphs flash cards included for each word list. Assessment instructions also included. |Everybody is a genius. But if you judge a fish on its ability to climb a tree, it will live its whole life believing that it is stupid. Assessments need to be easy to implement and should cover a wide-range of ability levels. It’s not one size fits all… and now it never has to be again. Click here to grab the Math Assessment.